Home › Announcements › Issues of the Crook County Journal Now Online, 1901-1921! Thanks to a partnership with the Crook County Historical Society/Bowman Museum in Prineville, Oregon, issues of the Crook County Journal are now online at Historic Oregon Newspapers! The Crook County Journal reliably kept residents of Prineville, Oregon, informed for more than two decades, beginning in the 1890s. Throughout its run, the newspaper was published weekly, arriving hot off the press every Thursday. In 1901, readers could get the Crook County Journal for $1.50 for a one-year subscription, 75 cents for a six-month subscription, and 50 cents for a three-month subscription. At the end of the Crook County Journal‘s run, in 1921, subscriptions to the newspaper were only offered on an annual basis, for $2 a year. For the first decade of the 20th century, readers of the Crook County Journal were treated to four pages of content. In later decades, the newspaper averaged eight pages. Topics covered included local and state news, especially politics and natural disasters, school happenings and construction projects. Advertisements, which increasingly took up more page space with each passing year of the newspaper’s existence, touted a range of products and services, from typewriters to farming equipment to menswear to banking services. Content from the Crook County Journal can be browsed online at the Historic Oregon Newspapers website. Each issue of the newspaper can be browsed by issue date via the website’s calendar view. In addition, specific content can be found through keyword search on the website’s search page. PDFs of newspaper pages can be downloaded. All issues of the Crook County Journal that are now online are available for browsing, searches, and downloads – all for FREE at Historic Oregon Newspapers! Historic Oregon Newspapers now has weekly coverage of the Crook County Journal from January 2, 1901, through July 7, 1921. 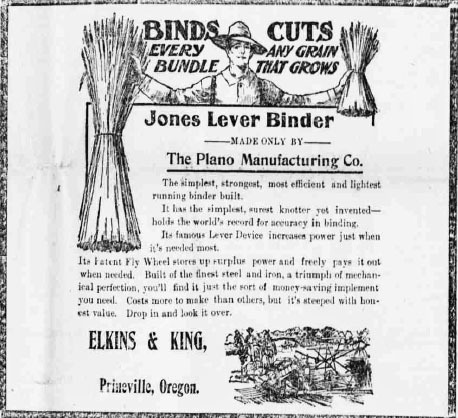 Take a look at this and other historic newspaper content from Oregon at Historic Oregon Newspapers! ‹ Chronicling America, Historic Oregon Newspapers Now with New Content!